New specifications for Nvidia's GTX 1050 and 1050 Ti GPUs have leaked online, with expected availability in mid-late October. The Nvidia GTX 1050 Ti is expected to offer 768 GPU cores and 4GB of GDDR5 memory, offering the same number of GPU cores as their Maxwell powered GTX 950 but much higher GPU clock speeds. The GTX 1050 is now rumoured to have 640 CUDA cores and 2GB of VRAM. 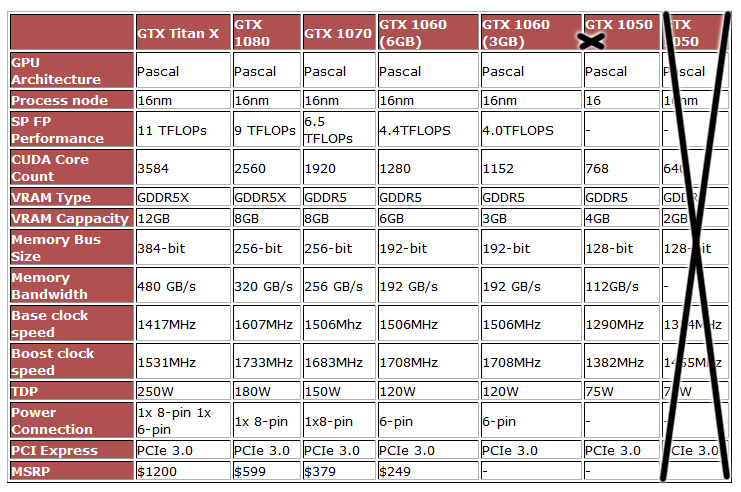 Below is a table of the rumoured specification of the GTX 1050 and 1050 Ti, which are said to be made using the Nvidia GP-107 GPU core design. At this time these GPUs are rumoured to be launching sometime in October, though at this time, retail pricing is unknown. You can join the discussion on Nvidia's rumoured GTX 1050 and 1050Ti GPUs on the OC3D Forums. Interesting stuffs and the rumor mill is in full flow, but here's how I see it going.